Where did you buy the belt from? I might switch out the belts on drill press with them. 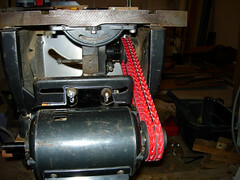 The pulley and link belt can be found as a kit at In-Line Industries http://in-lineindustries.com/index.html. The belts at In-Line run $6.00 per foot and $7.50 at Highland and come in 3/8 and 1/2 inch widths. I got the pulley and belt kit for my Craftsman saw and it reduced the vibration noticeably. The belt is easy to adjust and installs in minutes. Thanks for the review Mike. I agree with you that this one is well worth looking into for all the tools with v-belts. Mike – shortly after I purchased my table saw several years ago, I was not pleased with the amount of vibration I had in it. I purchased one of these sets and like you I have become a true believer. I also changed the belts on my lathes and drill press. Before the change, anything I had laying on the saw (push sticks, ruler and wood) would eventually walk themselves off the saw. After the change I could start the saw leave it run all night and everthing would still be sitting where it was when the saw was started. If anyone wants to dramatically reduce vibration, buy the machined pulleys and the power twist belt. I keep hearing about how good these belts are, and haven’t tried them yet. I keep waiting for one of my belts to wear out, but so far they’re no cooperating. They do indeed work very well. They have to be making a fortune off of them. You know that they cost them maybe $.20 a foot. I have them on every belt driven machine I have. Tried the first one that I got at a woodworking show and put it on the table saw. Then I ordered enough footage for everything else. A friend of mine was getting alot of vibration from his saw (just like mine) and we experimented. Took a styrofoam cut and filled half with water and turned on the saw. Old belt the little waves were erratic, link belt the waves were concentric. It helped. I know that $6.00 a foot is expensive but they show no signs of wear and I like how adjustable they are, once you get the hang of assembly. I remember buying 3 v-belts of different sizes sometimes to get the right tension, also shimming under the motor etc. I think that they are worth it. I’ve got 2 of them floating around my shop. I guess I should update the bandsaw because it’s the one that does viberate. I really like these belts. They are a little more expensive but well worth the money. A couple of years ago I stumbled into a 25’ box on ebay. I think I paid about 80 bucks for it. I now have belts on my jointer, bandsaw, drill press, my Dad’s drill press, and his lathe. Great stuff. Hi – All of my machines (table saw, drill press and jointer) have these belts. They’re the best! I HIGHLY recommend them. I noticed the best improvement on my 10” contractor’s saw (though I haven’t replaced the pulley yet). I got my link-belt and pulleys from Grizzly. I hot-rodded my 60’s era Craftsman with a 1.5hp Baldor and a double pulley/belt setup – smooth as silk!